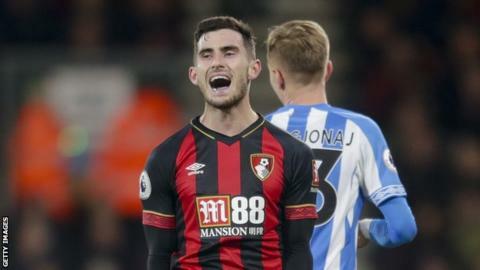 Bournemouth midfielder Lewis Cook will be out for between six and nine months after rupturing the anterior cruciate ligament in his right knee. The 21-year-old England international sustained the injury during the Cherries' 2-1 Premier League win over Huddersfield on Tuesday. Cook has made 56 appearances in all competitions for Bournemouth since joining from Leeds in 2016. "We are all devastated for Lewis," said Bournemouth manager Eddie Howe. "It is a huge blow to a talented player who has been a very important part of our side over the last 18 months. "Lewis is a strong character who only has to look around our dressing room for inspiration of how an injury like this is merely a setback and to know that he can come back better than ever." Cook captained England Under-20 to the World Cup title in 2017 and won his first senior cap in a friendly against Italy in March. Bournemouth are seventh in the Premier League after 15 matches. © Copyright Online Bookies 2019. All rights reserved.